Just a few steps from Sukhumvit Road - the heart of Bangkok' s downtown business, entertainment and shopping area - and less than 500 metres from exit and entry points to the airport expressway, the Amari Boulevard Hotel enjoys a marvelous location. The Amari Boulevard Hotel offers a variety of accommodation to suit your needs and ensure a comfortable and pleasant stay in one of Bangkok's key locations. Comfortable accommodation in the heart of Bangkok. In addition to the facilities available in our superior room category, deluxe rooms offer superior comfort. Relax in front of the large screen television or enjoy a luxurious bath in the modern granite clad bathroom. All deluxe category rooms offer separate bath and shower facilities. Most rooms in the deluxe category feature an airy outdoor terrace with sun loungers. The corner rooms are particularly light and breezy and are ideal for long term stays, as they possess a home-style character. Luxuriate in the comfort of an Amari Boulevard Suite. Well-appointed throughout, this room category offers that extra touch of elegance and style. One popular detail is the large round bath; ideal for soaking away the stresses of a busy day. Enjoy a wide range of buffet and à la carte dishes at The Peppermill Restaurant, authentic Thai cusine at Season or some light refreshments and snacks in the Lobby Bar. The Amari Boulevard Hotel also operates two nearby restaurants; the fun and informal Pasta n' Noodles recently called 'an ace of a place' by a Bangkok Post food critic and the popular La Gritta Italian Restaurant, one of Bangkok's favourite venues. Amari Boulevard Hotel offers several recreational options. Enjoy a workout in the fitness room, treat yourself to a traditional Thai massage or simply relax by the pool. Alternatively, there is no end of entertainment options available in the immediate vicinity of the Amari Boulevard Hotel. 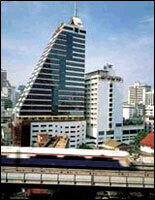 Its location in the thriving Sukhumvit Road allows easy access to shopping, dining, cinemas, restaurants and nightclubs.